Henan, a province with a few centuries-old Buddhist temples in Central China, has got a new tourist attraction that is a towering statue of Mao Zedong, the founding father of the People’s Republic of China. 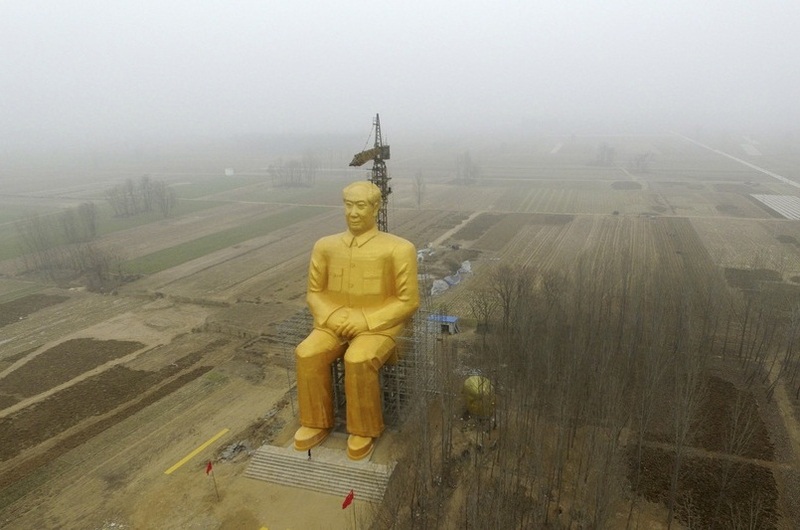 The colossal statue of Mao Zedong, painted in gold, is 121 feet tall and seated at a vantage point amidst rugged farmlands. The construction by a group of capitalists has earned a mixed response from China’s thinkers, diplomats, and elites. The statue of Mao Zedong seating on a chair with hands crossed in his lap and looking towards the infinity took nine months to be completed and cost 3 million Yuan. Many local entrepreneurs contributed to the fund for the massive construction. The Chinese citizens are divided in their opinions about Mao Zedong, a most powerful communist revolutionary who ruled China with a heavy hand for three decades. He is blamed for the death of millions on the one hand and widely respected on the other. The towering statue of Mao Zedong in Henan has garnered compliments and criticism on SinaWeibo, a Chinese micro blogging site equivalent of Twitter. China’s current President Xi Jinping referred to him as one of the greatest leaders in the history of China. The extravagant cost of building the statue has irked some people, while some other have voiced the slogan “Long Live Chairman” while bowing their heads before the statue. However, the controversial statue of Mao Zedong will add to the historic and heritage tourism of Henan where the ruins of several dynasties are lying scattered. Visit China and explore its tourist attractions especially when cheap airline tickets to China are available at iEagle.com.